A new high capacity ventilation fan has been launched by industrial hire specialist Andrews Sykes. The fan is set to maintain its excellent extraction rates of 38,000m3/h on 24in pipes and runs of 40m. The new FV 1800 ventilation fan is ideal for organisations particularly involved in construction and tunnelling projects for short to long-term hire. Installation is simple and financially sound as the fan often eliminates the need to hire a number of smaller units. With double the capacity of any other model in the Andrews Sykes hire fleet, the new FV1800 achieves an air flow of 38,000m3/h. Equipped with IP55 electrics that make the unit equally at home for indoor, damp and outdoor installation and featuring an efficient three-phase, close-couple motor which uses only 11.6kW/h when operating, producing a low line pressure of just 0.025bar (2500 Pascal). 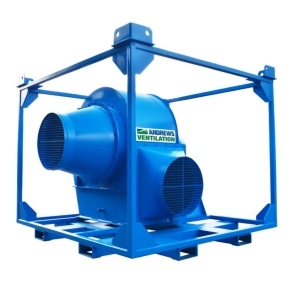 The fan aids the removal of dangerous fumes, dust particles and providing clean air for large applications across many market sectors. The fan has a higher capacity of ventilation extraction solution than previously available from Andrew Sykes with all the standard features of Andrews’ current FV range.